The SRFAN1U SmartRack 1U Fan Tray is an ideal accessory for increasing ventilation within your rack enclosures and server cabinets. Better airflow keeps your valuable rack components cool, helps boost system performance, and avoids costly equipment failures that lead to downtime, damage and data loss. The SRFAN1U requires only one rack space and installs easily in an enclosure or server cabinet. 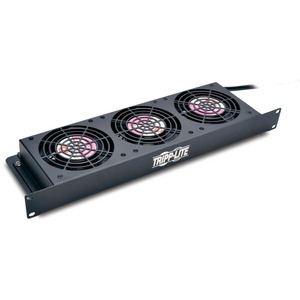 It includes three powerful four-inch 120V fans that should be mounted low in the rack in order to push cool air toward the top. The high-performance fans circulate air at 210 cubic feet per minute (CFM). The 1U tray is constructed from heavy-duty cold-rolled steel that is built to last. The six-foot AC power cord plugs into any NEMA 5-15R outlet.